British Columbians who have found themselves with unanswered questions about Islam can now pursue a greater understanding of the religion by having a personal conversation, and a hot drink, with a local Muslim. As part of the Coffee & Islam campaign, Canadian Muslims are making themselves available to anybody with an inquisitive mind to sit down in a coffee shop and talk about their faith. Officially launched in November, people like Tariq Azeem, a Missionary Ahmadiyya Muslim living in Vancouver, have been hosting these meetings for over a year. 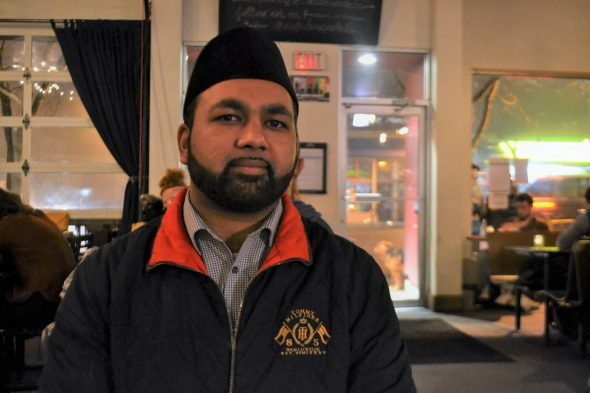 Azeem is a congregation leader for the Muslim community in this city, and like all of the volunteers with Coffee & Islam, everything he does, he does for free. His work as an educator on Islam goes beyond the time he spends in coffee shops. Azeem says that he tries to bring his desire to explain what it means to be Muslim into his everyday life. Some of the most common questions that he receives are about Jihad—a topic which he calls “very misunderstood”—or the status of women. Azeem has also noticed a great deal of confusion around the status of women in Islam, the details of whether or why Muslims actively speak out against extremists, and what Sharia Law is. “My main message when I talk to them is that every religion teaches two basic things: love God and love his creations. This is a message that is common among all faiths and religions. This is what we need to adhere to,” says Azeem. According to Statistics Canada, hate crimes against Muslims rose by 60 per cent in 2015 compared to the previous year, peaking at 159 incidents nationwide. While they began decreasing in number last year, many Canadians still report experiencing extreme racism, xenophobia, and Islamophobia being perpetrated by those who are not educated about Islam. With this campaign, Azeem and his peers are hoping to identify and correct misconceptions prevalent in the media, both to readers and news creators. Vancouver has proven to be one of the most responsive communities to Coffee & Islam, according to Azeem. He notes that he “received very good media coverage when the campaign was launched,” and hopes to continue doing meaningful work in the community well into the future. To get in touch with a representative from Coffee & Islam about organizing a meet-up, send a message through the campaign’s online contact form. Azeem encourages those who live in Metro Vancouver to get in touch with him directly at tariq.azeem@ahmadiyya.ca.